Veterans Get Free Show Tickets to Greg London - Impressions that Rock! In appreciation for their service to our country, Greg London – Impressions That Rock! is offering free tickets to all veterans for the Nov. 11 show at the Riviera Hotel and Casino in Las Vegas. Tickets available on a first-come, first-served basis. To get a free ticket, show your VIC ID (Veteran Identification Card) or DAV ID card (Disabled American Veterans ID) to the Riviera Casino & Hotel box office and receive a free ticket to see Greg London – Impressions That Rock! “Greg London – Impressions That Rock!” show rocks audiences Wednesdays – Mondays at 7 p.m. inside the Riviera Hotel & Casino. Tickets start at $39.99 for general admission, $59.99 for Preferred seating, and $69.99 for VIP. For tickets call The Riviera Box Office toll free at (877) 892-7469 or visit www.rivierahotel.com. For more information on “Greg London – Impressions That Rock!”, visit www.gregorylondon.com. 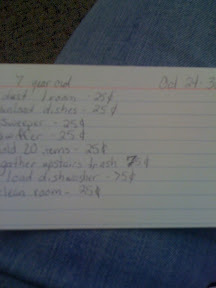 I use Children's chore cards at my houseas an incentive for my children to do chores around the house. I use a simple 3x5 index card. At the top is their name and that week's dates. Under is a list of chores your child is capable of achieving and the amount they are paid each time they perform that specific chore. 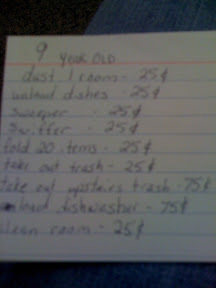 I decide my chores based on realistic goals for their ages. My nine year old can do more than my six year old and my three year old can do the least of all. So the tasks will vary. The earnings for each task reflect on hard the task is. For example when you take out the kitchen trash or the recycling it is easy. They close up the bag and throw it into our garage holder in the garage. It takes less than 1 minute making it worth .25. Also, this is a job just for my nine year old, because my six year old is too short. However, the upstairs trash is different. There are many little trash cans to dump into one bag and then haul down stairs and then it will be taken out to the garabage holder. This task takes more time and energy. My kids can use team work and both make .75 cents each. Each week we start over with a fresh card on Sunday. All week long I keep track of the chores they have done by placing a star next to the actvity. On Saturday I total it up and they get their 'pay day'. They look forward to pay day and are always excited. Last week they both made $1.75 each. They were happy to make so much money! On a week where I have had to ask too many times for them to do something or they have given me attitude I make them complete their tasks with no compensation. They lose the privilage of Earning money. I want them to recognize that we enjoy rewarding them, but only if they can have a good attitude without complaining. Applebee's - Free dinners to veterans throughout the day. Coushatta Casino Resort - The Louisiana casino and resort is offering a free seven-clans lunch or dinner buffet to veterans or active military. MarketPlace Grill & Express - Veterans and active-duty military receive free entrees. Masala Wok - The Northern Virginian restaurant is offering a free entree to veterans. Hy-Vee supermarkets - The mid-western supermarket chain is offering a free breakfast to veterans. Abuelo's Mexican Food Restaurants - All veterans and active-duty military receive a free entree. Carolina Burgers & BBQ - In Matthews, NC is offering a free meal to all service members and veterans. Brides Across America - Provides free wedding gowns to qualified military brides. Lowe's & Home Depot - Extra 10% off to active-duty military members, National Guard and reserve members, retirees, honorably discharged veterans and immediate family members. Sam's Club - Over 25,000 Hugo canes will be given away to U.S. veterans in need of mobility assistance. Membership is not required, but supplies are limited, so check with your local store. Amazon.com - Free "Veterans Day Honor" MP3 album download. The album includes 12 songs by The Bands and Ensembles of the U.S. Armed Forces. Cabela's Outdoor Store - Offers their employee discount to all veterans, active-duty military and reserves, law enforcement, fire and EMS personnel Nov. 11-12. Discounts vary from 5% to 50%, depending on the item. Build-a-Bear Workshop - Members of the armed services including the Army, Navy, Marine Corps, Air Force, Coast Guard, and Reserve Officer Training Corps, will receive a 20% discount Nov. 11-15 on any one transaction at Build-A-Bear Workshop. Dollar General - 10% discount for all veterans, active-duty military, National Guard and reserve and their immediate families. Fashion Bug - 20% off all plus-size and misses clothing purchases with a copy of military ID or spouse's military ID. National parks, forests and monuments - Admission is free to everyone on Veterans Day. Knott's Berry Farm - Free park admission to U.S. armed forces personnel and a guest during Veteran's Month, November 1-26. Colonial Williamsburg - Free admission Nov. 6-11 for active-duty military, guard and reservists, retirees, veterans and their dependents. San Jacinto Museum of History - Free visits to the Observation Deck, theatre, and special exhibit for veterans, active duty military personnel, and their families. Historic Jamestown - Free admission to veterans, current Armed Forces members and their family members. Battleship Cove - Free admission and a special ceremony for veterans, active, duty and reservists. Birmingham Museum of Art - Free admission to the ticketed event "Life and Liberty" on Nov. 10-11 for veterans and active military. National Cowboy & Western Heritage Museum - in Oklahoma City offers free admission to veterans and five guests from 9 a.m. to 5 p.m. on Veterans Day. With multiple bases located in the panhandle of Florida there are lots of places that offer a military discount. Here are Panama City Beach military discounts! We are a few weeks behind on the Biggest Loser. I think these Vegan recipes were on episode 3 or 4. The contestants got to go to Bob's house to eat and he had nothing but vegan dishes. They looked awesome. I am not a vegan, but I am always looking for healthy side dishes for my family to add to our dinners. It took me a while to find the recipes, but it turns out Bob has a blog. This is where I found the four recipes spread out in two different posts. Here is a link to the initial post with the first 3 recipes in it and then if you click on his tag Vegan Recipes at the bottom you will easily find the fourth recipe. Panama City Beach is a fun weekend trip or a week long vacation. Southwest airlines now flies into Panama City Beach! This awesome area is more accessible than ever! Here is a list of a few things to do while you are there. St. Andrews State Park- This park has a great “kiddie pool” area where the rocks block the waves from coming into a large area , nice campground, and Shell Island shuttle. I also hear this is good fishing if you climb over to the other side of the rocks. Zoo World - This may not look like much from the road, but they have lots of animals. They even have lions! Army Recreation Area - Destin area beach cottages for rent for military with id. Informational booths, interactive displays, free food, earth-friendly vendors, and music. Live music, food, art, crafts, children's activities, info on green products and local environmental research. More than 100 organizations and businesses will offer food, entertainment, kid-friendly activities, and info on early education. First Friday Downtown – 1st Friday on Harrison Ave in downtown Panama City, FL.